// x == "Hello world!" Or alternatively, manually copy the repository into a node_modules/node-azure folder. var hits = indexSearcher.Search(query);     // this method is to be deprecated, however, I can't find an easier way of doing it! Never have I worked with a library with so many obsolete and deprecated methods. It’s quite hard going! Would you mind clarifying if this code that you posted is something like “public domain” that I can freely adapt into my commercial project? Elijah, this code is public domain, you can do with it as you wish, although I take no responsibility for loss or damage incurred! Thanks! This code helped me get up and running along with the use of some code in https://svn.apache.org/repos/asf/lucene.net/trunk/test/core/TestSearch.cs (r1383623). Clicking on an item shows a different page, and asks you if you want to delete it. Very simple. There is no security, no error trapping, and it looks awful in Internet Explorer – but it proves a concept. Let’s dig under the covers. The application running in the browser should be a static HTML file. This allows us to consider offline use with HTML5 storage if available. When the application is running, only data (JSON) should be exchanged with the server. We should not be rendering markup on the server. This keeps our bandwidth requirements to a minimum. So when the URL matches the first route (i.e. ‘…/#/view/1234’) the ‘two10.actions.view’ function is called, passing in ‘1234’. Otherwise the second route is matched, and ‘two10.actions.defaultAction’ is called. Note how in the link for the delete button bypasses the routing, and invokes the controller directly. This is because I want to emulate a post, and I don’t want the URL for deleting the item to appear in the browser or the routing table. 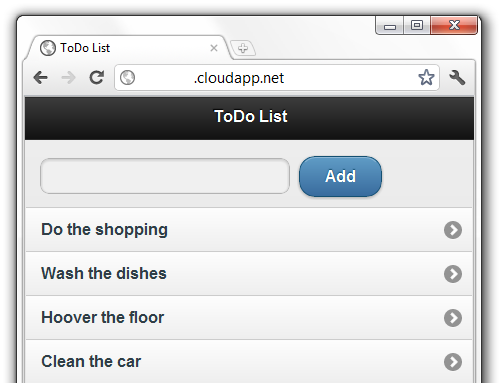 I attempted at first to use JQuery Mobile to enhance my markup (and make my application look pretty). However there is also a routing capability with JQuery Mobile, which conflicts with Backbone. Despite efforts to disable it, I decided to just use the CSS from JQuery Mobile, and put the enhanced markup in my templates. Whilst this requires more effort when writing the templates, it probably improves runtime performance by reducing the amount of DOM manipulation required in the browser. The server side code is a node.js script. The first thing it’s required to do is to serve up the HTML page to the browser. The code running on the browser does a GET as soon as the application starts, node retrieves the data from table storage, and just returns it back to the browser. Every time the user changes the items in the todo list, the application does a POST to node, which just saves the data in table storage. 4. Deploy, and stand back. I would like to see more investment in node on the windows platform, currently the Node Package Manager (NPM) hasn’t been ported, (read how to do this manually) and it would be better to have node running under IIS than a background task in a Worker Role. The power of routing and templating in the browser shouldn’t be underestimated. With the addition of some HTML5 features, this technique could seriously compete with Silverlight. I don’t think this stack is the solution for everything, but if you want multi-device support, good scalability and low bandwidth requirements, you should certainly consider it. Bear in mind though, node is in it’s infancy, this is the bleeding edge. The entire source can be downloaded here. By using a function that dequeus messages as an IEnumerable, you can easily plug in the parallel task library to process message simultaneously. The added advantage to this approach, is that messages added to the queue once the loop has started will still get processed. You could wrap the whole Parallel.ForEach in a loop, and use Thread.Sleep to pause whilst there is nothing in the queue to process. This is really clever, I like the usage of “yield return” to make an iterator for dequeuing messages. Great work. 2. By default text files are saved as ‘Unicode (UTF-8 with signature) – Codepage 65001’. Unfortunatly this seems to add an extra unwanted character to the start of the file, which prevents the script form being run. 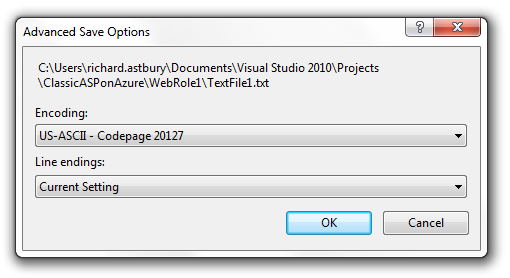 Go to ‘Advanced Save Options…’ in the file menu of Visual Studio, and select ‘US-ASCII – Codepage 20127’. 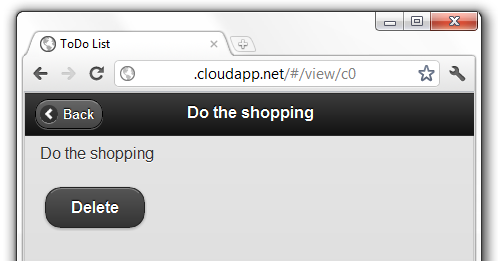 Sure, the Azure Websites support classic ASP. You can deploy using FTP or Git. A lightweight .NET library which makes working with the Azure API easier. Define a class which represents your table, and optionally supply a name using the ‘TableName’ attribute. Primary keys (GUIDs) are automatially assigned. All commits are performed on disposal of the context. Queues are strongly typed. Let’s say we are working with this class. In this case, the message will only be deleted if ‘VoteCommit’ is called. The queue name is automatically derived from the type name ‘Foo’, however you can override this as well. One of the problems that often crops up with moving legacy applications to the cloud is reliance of sticky sessions. The Azure load balancer works on a round-robin basis, so if your application has been designed to work on a sticky session basis, you may have some work to do. When you provision new instances, only new sessions will be routed to them. Depending on your load balancing logic, new sessions may also still be provisioned on the old instances. This results in it taking a long time (depending on the average length of your session) for load to be evenly distributed across your instances. Cloud solutions should be designed to fail. One of your instances may be removed at any time for patching, or hardware failure. With a sticky session scenario, the clients with a session on this instance will probably have to log in again, or may see an error page, depending on your load balancing logic. Unless your load balancer shares state in some way, it’s likely that you’re load balancing with a single instance (single point of failure) and not eligible for the Microsoft SLA. Use the Azure AppFabric Cache to share ASP.NET session state across your instances. This walk through shows you how, by simply changing your Web.config. Hi Richard, would you mind expanding on point #3 please? What is the single-point-of-failure in this case and how does that affect the SLA? Sure, to achieve the 99.95% SLA, you must have two instances of every role. It you just have one, you get a 99.9% SLA. However, as you can load balance with a cookie, you can set up several instances without having to share the state. Richard, great post on why moving away from relying on sticky sessions is a good idea. One thing any of your readers should be aware of though. If you plan to use SharePoint 2010 with FBA or Claims then using sticky sessions is a requirement. Clearly Microsoft have not followed best practices when designing SharePoint 2010 and scalability!!! AzureBlobDrive can run either on an Azure instance, or on your local machine. + If you have an existing application which you want to migrate to Azure, but it needs to read/write to a persistent drive. + If you have an application split across Azure and a local data centre, and they need to share files. + If you want convenient access to blobs and containers from your local computer. Storing files that change a lot (i.e. database files). Watch a video of AzureBlobDrive in action. Update the app.config file in the Two10.AzureBlobDrive.Console project, to point to your Azure storage account (alternatively you can use the Azure emulator). Run the Two10.AzureBlobDrive.Console project. An ‘R’ drive will be mounted, you should be able to see your containers. Update the Two10.AzureBlobDrive.Console.exe.config in the Two10.AzureBlobDrive.WorkerRole project, to point to your Azure storage account. Publish the Two10.AzureBlobDrive.CloudProject project to Azure, the role will install the Dokan driver with an elevated startup command, and the worker role will mount the ‘R’ drive in the ‘Run’ method. AzureBlobDrive is alpha quality code, and has a number of limitations. Some of these limitations are passed on by the inherent limitations of Azure blob storage. 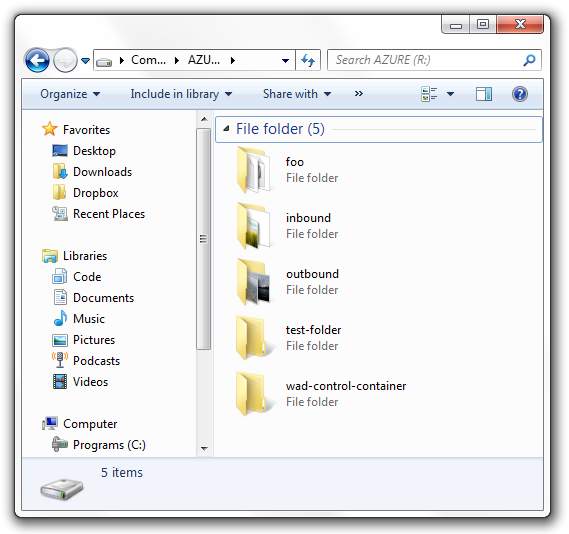 Files can only be placed in a folder (container). You cannot have files in the root directory. Folders cannot contain folders (blob storage does not support hierarchy). Root folder names (containers) must be in lower case, and cannot contain spaces and other special characters. Performance is poor, and large files are not recommended. Files and folders are cached for one minute, so changes made by other machines may not be instantly viewable. Files (blobs) cannot be empty (i.e. have a zero size). AzureBlobDrive uses the Dokan file system driver (http://dokan-dev.net/en/). Dokan provides you with an interface for calls to the file system, such as ReadFile, WriteFile etc… The Two10.AzureBlobDrive project contains a class which implements these methods, accessing blob storage to retrieve the information. The Azure Worker Role is configured to install the Dokan dependencies (Startup.cmd), and then start the Two10.AzureBlobDrive.Console application as a background task. Some of these limitations will be improved over time. Feel free to fork the repo! hi.. awsm wkr with this project. i was looking smthing exactly like this cuz i need to build a system to in azure for files with programatic access restrictions. however can u help becuz the run method of the worker role present contains no code to mount the drive and also the console that is supposed to work inside windows locally is also exiting without any error and without any drive being mounted to my system. What are you trying to say? Stopped reading your post because your writing style is annoying, please use proper english to be heard and understood.